The Orthopaedic Education and Research Foundation of Southern California (or OSI Foundation) is dedicated to providing educational forums to the public, allied health providers and physicians. Our conference center can be utilized for symposia, conferences, and dinner meetings. The facility includes state of the art audio-visual services, live surgery audio-video broadcasting and internet preservation of the lectures and/or the surgeries. Depending on the format and topic CME accreditation can be provided. 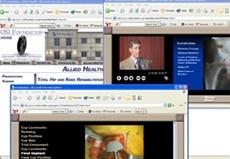 We are currently developing a lecture series for patient and physician education. Total Knee Arthroplasty "LCS PS Total Knee"